It’s the OB Rag’s 7th Birthday! Editor Note: You are reading the San Diego Free Press today because a group of visionaries at the OB Rag raised the possibility four years ago. Many of us whom you read at SDFP got our start at the OB Rag. Special thanks to Frank Gormlie and Patty Jones. We wouldn’t be here without them. This is the 7th birthday for the online OB Rag. During the October fires of 2007, Patty Jones and I launched the OB Rag out of our small cottage on Long Branch Avenue. Many of our early articles critiqued both the mainstream media’s coverage of the fires plus how the fires were being fought. Seven years later, much has changed, of course. We’ve gone from a little-known blog to one of the best community-based websites in Southern California, which is constantly referred to by the local mainstream media, police, and local politicians, and occasionally we make the national news. Other notes of interest: quotes from the OB Rag made it up on the ceiling of OB’s newest public “comfort station” on the beach – whose design won an Orchid Award in 2012. One of proudest moments came in early June 2012, when we launched the San Diego Free Press – and now it’s doing just great, with an average daily readership of over 2,000. Both websites, the OB Rag and the SD Free Press, won awards from the San Diego Chapter of the Society of Professional Journalism this past July. And just recently, the OB Rag was honored with the Community Partner award from the OB Town Council for our coverage and contributions to the OB Community Plan update battle. Sure, we’ve had our ups and downs. A year ago, we put out a plea – a call for help, as we felt the OB Rag was then at a cross-roads. OBceans and other folks responded, – a number of readers sent us a one-time donation, and about a dozen generous people donate a monthly contribution to us via PayPal (which is right there on our homepage). The OB Rag blog and website was first initiated by Frank Gormlie and Patty Jones in late October 2007 and our original intent was to ply the San Diego scene with news and commentary from a distinctively progressive and grassroots perspective, and to also provide a forum for those views. Importantly, we also wanted to provide some kind of web platform for the Ocean Beach community. And in the Spring of 2013, we opened up a small office within the Green Store on the 4800 block of Voltaire Street. In October 2014 – we reached our 7th anniversary – and we’re still going strong. We’ve changed a lot – writers and bloggers have come and gone – but the Rag continues to provide a web platform for OB residents and merchants, and covers local OB and Point Loma news, issues and events. Besides providing a news site for OB, we also wanted to be a resource for San Diego’s peace movement – as the Iraq War was still going on. At our year anniversary – late October 2008 – we had a daily “visitor” or reader average of over 250. Around that time, we decided to focus more of our attention and energies on OB itself. In the Fall of 2008, we were joined by Doug Porter, who now writes on a regular basis for San Diego Free Press, and who wrote for the original OB Rag back in the seventies, and by Anna Daniels, who is active on city-wide issues on the SDFP and writes about her own neighborhood of City Heights. By October 2009 we had a daily visitor count somewhere between 500 to 900. And we were taking advertisements and sponsorships and selling hot-looking T-shirts. Our stats just continued to rise dramatically over the months. In March 2010 we are averaging between 750 and 1,000 visitors a day, and with over 26,000 visitors for that month. That June we had 34 visitors short of 40,000, and by that Fall it was 1,200 to 1,400. Then in October 2010 we had 43,000 visitors. In the Fall of 2011, and our very best month – October 2011 we had 108,000 visitors – this was during the Occupy Wall Street movement. Other milestones: we had our one-millionth page hit in mid-December of 2010, and our two-millionth hit in November 2011. Since then, our stats have leveled out due to the impact of the publication of the San Diego Free Press. We still have anywhere from 1500 to 2,000 readers each work day, Monday thru Friday. Another large plus: more and more local businesses are starting to cozy up to the idea of having advertising on the OB Rag – which allows us to have a part-time writer/ social mediaist. We’ve had a plethora of writers, bloggers, contributors, photographers, and close supporters over the years – some of whom continue to write and contribute. They include (alphabetized by last name): Brittany Bailey, Mercy Baron, Jon Carr, Jon Christensen “JEC”, Kristin Condon, Judi Curry, Anna Daniels, Stephanie Denton, Colleen Dietzel, Chris Dotson,Tony de Garate, Dave Gilbert, Gary Gilmore, Jim Grant, Nate Hipple, Rich Kacmar, Steven Kindrick, Kip Kruger, Lois Lane, Sarah Little, Mary E. Mann, Ernie McCray, Brenda McFarlane, Danny Morales, Rick Nadeau, Jim Noble, Abby Normal, OB Cindi, Doug Porter, Bill Ray, Dave Rice, Gregg Robinson, Genie Sapienza, Stu Seymour, Marc Snelling, Michael Steinberg, Jeff Stone, Sunshine, Lane Tobias, Wireless Mike Williams, John Williams, Matthew Wood. Things have changed since we first started blogging. We initially supported the candidacy of Barack Obama for President, and we celebrated with champagne and tears the night he was elected. But our eyes are not shut. We remain critical – and hopeful – of our political environment. We have come to deeply understand that progressives need to keep pressure on the White House, no matter who is in it. And it’s important to develop broad coalitions of activists and like-minded people, to not be hampered by some restrictions of our political traditions, and be willing to work across different parties and communities. We have become very disappointed in what President Obama has achieved and not achieved during his years in office. We remain critical – and hopeful. When we first started this blog, we felt that we needed “to rebuild a sense of community, not only on the neighborhood level, but also amongst those of a kindred spirit.” We have expanded our circle of friends and readers, as we have a solid base of Ocean Beach readers, a San Diego, national and even international audience. We have nearly 2,400 names on our email news and support list. 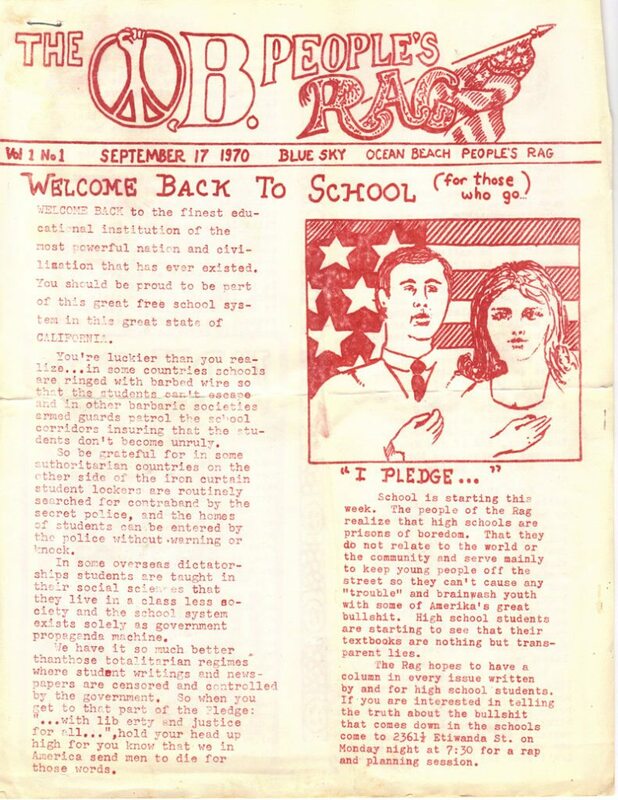 The first OB Rag, actually the OB People’s Rag, was an alternative grassroots newspaper for the Ocean Beach neighborhood of San Diego during the first half of the 1970s, with its first publisher, editor and writer Frank Gormlie. It published from late Summer 1970 to early Fall 1975. The Rag’s volunteer and dedicated activist staff succeeded in fueling the community organizing in Ocean Beach during those years with their underground publication, taking on the establishment while giving voice to the burgeoning counter-culture. The very first issue of the OB People’s Rag – September 17, 1970. Much later, in the early years of this century, folks associated with the Ocean Beach Grassroots Organization (OBGO) and the Save Ocean Beach Coalition published several editions of a new version of the OB Rag (see below for a sample front cover of this version). There are at least two issues of that version of the OB Rag scanned here in our blog. Describing itself as an independent left and progressive newsletter, the Pie Shop was initially sponsored by the Borderlands Education Committee – itself a creation of an Ocean Beach political collective. Current and occasional writers for the OB Rag, Frank Gormlie, Rick Nadeau, Michael Steinberg and Gregg Robinson all wrote for the Pie Shop from its inception in 1981 through the end sometime in 1986. Issue Number 10 has been scanned and added to the site. Click the image to the left to view the whole issue. Feliz birfs to the OB Rag and the rag tag twosome that made it possible! Thanks Anna, for reposting this, with its special twist. It made local google news. Moments ago, I realized that my very first article for the very first OB Rag was satire! It was Sept 1970, and John Lyons drew the mast head from my idea, and also drew the front page graphic of the 2 kids citing the pledge.